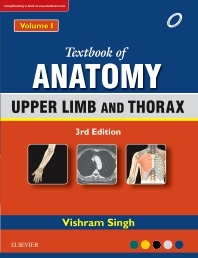 Third edition of this book is thoroughly revised and updated in accordance with the syllabus of anatomy recommended by the Medical Council of India. It covers in detail the anatomy of upper limb and thorax. The anatomy of heart and lungs is co-related clinically in depth. Following recent trends of anatomy education, the book in addition to basic information provides knowledge on anatomical/embryological/histological/genetic basis of common clinical problems through its features — Clinical Correlation and Clinical Case Study. Written in simple and easy-to-understand language, this profusely illustrated book provides the knowledge of anatomy without extraneous details. The specific learning objectives have been given in the beginning of each chapter to facilitate self-learning by the students. Ideal for UG medical and dental students, NEET PG entrance examinations, USMLE, PLAB, FMGE, etc.